We are putting the final touches on our plans for a Fall Open House this coming weekend . . . lining up the goodies to sample and the goodies to give away. Remember that if you cannot make it in person to this event (or even if you can), you can still sign up online for giveaway goodies. Be sure to check back here the end of the week (Friday, Saturday, Sunday) for instructions on how to do this. Remember when you do come to bring along a canned food item (or several if you’re feeling generous!) The can will give you $5.00 off a purchase of $20.00 or more . . . then at the end of the weekend, cans will be gathered up and donated to the Hanover Area Red Cross Food Bank. In the meantime, we do have regular business to attend to. 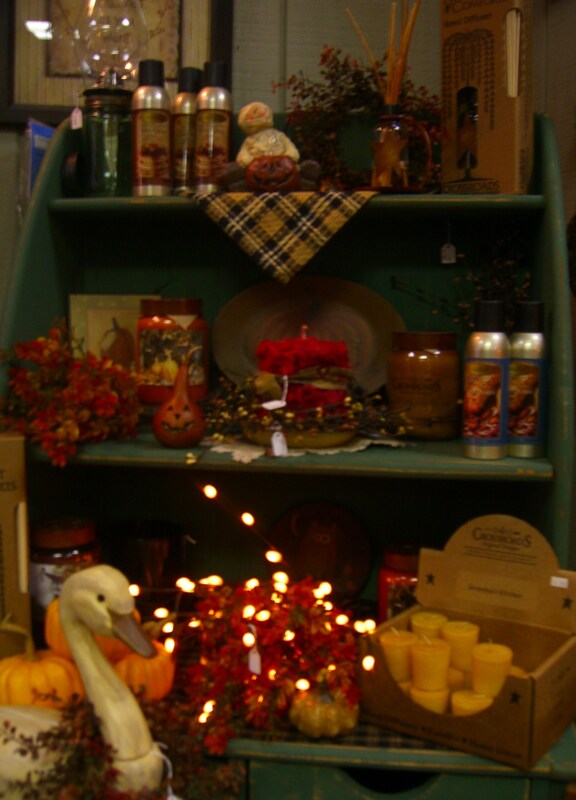 Did we mention that during the month of September, we have specials on Crossroads Designs Candles. Crossroads is one of our favorite candle companies (we have several) . . . their candles burn nicely and the scents are incredible. Their diffusers ( a bottle of fragranced oils with a bundle of reeds) give heavenly scents anywhere you decide to place them. Make sure you check out our weekly special . . . . or take advantage all month of the mini melt special — buy 6 for $5.99. A great deal! When you are in the mall this week, check out our display ‘window’. While we do not have storefront windows at our location, we are able to ‘dress’ a window part-way up the main mall hall in another storefront window. We love decorating for the fall season (we have mentioned that several times recently), so the window includes some items we have in the store, of course, but mainly we want everyone to enjoy looking. There’s a scarecrow and a fall tree, a basket of apples and basket of mums . . . look more closely for the owl, the chipmunk and the apple cider jug! One of our personal favorites in the window is Sawyer — a lighted gourd from Meadowbrooke Gourds in Carlisle, PA. He’s sitting on a metal base that we have available in the store that is waiting to hold your jack-o-lantern or a pot of mums. Sawyer on the metal stand is shown on our September 1st blog entry enjoying one of the last really warm days we had this month. Finally today, make a point to check out Kathy Fincher’s ‘Mamma Says . . . ‘® Nativity Collection. New to us, we have loved this for years. Now, we have it in stock to share with you. 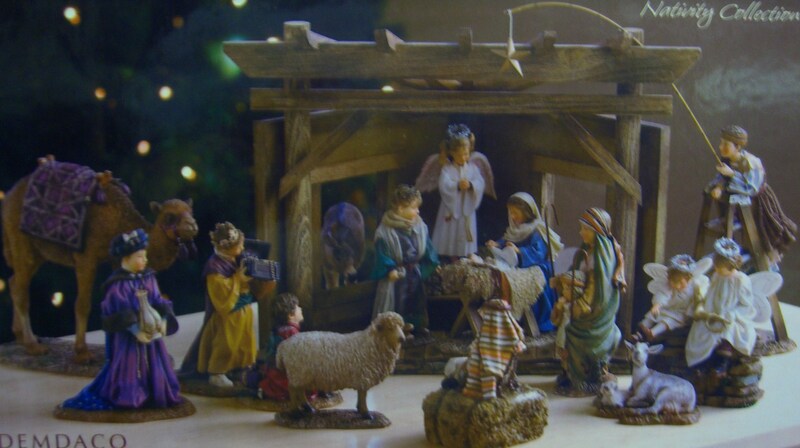 Each child (and animal) participating in this Nativity Pagent posed for Kathy to photograph. Then she sketched, sculpted and painted each original piece to make it realistic . . . and it is precious! We have a limited amount of pieces at this time. While you are looking, we can share the ‘behind the scenes’ story of how it all came together. We know you will love it, too! Each figurine for this collection is boxed separately, and can be added on piece by piece. Cherish your uniqueness, celebrate your gifts.